On 10th of February 2015, a Finnish IT Service Provider Samlink asked external help, ideas and insights by involving multidisciplinary professionals into Designing Open Innovation Activities mini workshop. 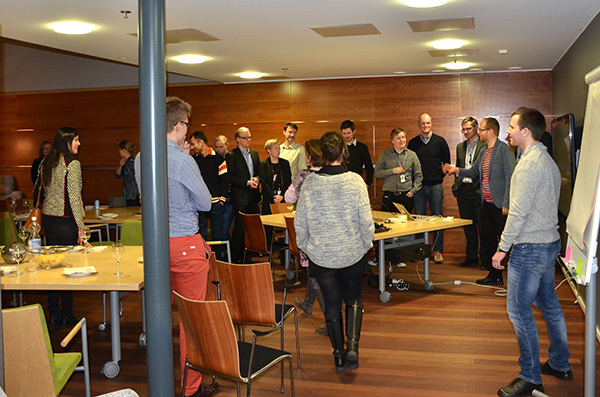 The event was organised and hosted together with the Service Design Network Finland. The purpose was to ideate what different kind of Open Innovation models, frameworks and activities Samlink could provide in future. Samlink, the company that I work myself too, also wanted to share knowledge for the community. About thirty participants entered the event from Aalto University, Laurea University of Applied Sciences, start-ups, bigger ICT-companies, freelancers, entrepreneurs, etc. People with diverse backgrounds attended the event: service & systems architects, developers and service designers, innovation managers, and so on. CEO of Samlink, Pentti Unkuri, opened the event by presenting some facts about Samlink and trends that are affecting in financial services. Security director of Samlink, Jari Pirhonen, discussed how information security should taken care when designing services. Next, Mahnoush Mojtabaei from Aalto University explained Open Innovation in her speech ‘The Brave New World of Open Innovation’. After the inspirational speeches, a mini-workshop about modern Open Innovation activities was arranged. People worked together in six smaller groups. They discussed, drafted and visualised ‘who’ and ‘what’ should be included within a modern future Open Innovation environment. The most important principle teams had to keep in mind was: ‘everyone should win and gain value within the ecosystem’. No other limits were given for envisioning and even wild ideas were naturally encouraged. The teams were asked to visualise their conclusions by using stakeholder maps. All teams also pitched their Open Innovation environment concepts and demonstrated how different stakeholders could create value together (watch videos here). We at Samlink are quite satisfied within the event and workshop results. Positive feedback was received afterwards and people found the content valuable – that’s the best thing! Why we think that the event was a success? A clear goal for the event was framed with top managers in Samlink. This made it easy to focus designing the whole event. Great communities and people were contacted, involved and interviewed in early phase: discussions and visits in Aalto Open Innovation House (thanks Mike Bradshaw, Mahnoush and many more!). Collaboration between different Facebook interest groups in Finland that relate open innovation and service design was essential as well. Event topics were tested in very early phase and made sure that participants should find the topics valuable and inspiring. The audience was allowed to place questions for the speakers before the event. This made sure that speakers had time to prepare and the audience received valuable knowledge. Samlink got interesting new connections. I wish all the participants got the same. …and what could have been done better? Next time, ‘liquid timing’ during workshop facilitation should be remembered as Marc Stickdorn explained at Laurea… So the schedule was a bit too tight and prolong itself. The workshop could have been organised and facilitated better. All different stakeholders within open innovation ecosystem should have been found and facilitated in smaller parts and steps. “Who should be within the Open Innovation environment?” was too broad question even though some examples were given. Teams felt this hard approach. More time for mingling and chatting should have been reserved. Workshop results should have been published earlier after the event. And, prepare for video shooting earlier not to have a blurry video… Sorry for that. Samlink will have a reality-check and consider if there are real latent potential within some of the concepts and may contact and continue work with chosen team members. It was pleasure for me to work as a key organiser within the event. I enjoyed to bring same-minded people together. Also, I always love to see creative people working together by solving shared challenges. The post was written by Antti Kytö, a service designer in Samlink. He’s doing his MBA in Service Innovation and Design in Laurea University of Applied Sciences.